Obsolescence at 10 percent appears to be growing with rapidly changing technology and increasing government regulations. Do you remember the U.S. government's Cash for Clunkers program? If you operate a coal fired power plant, can you see obsolescence on the horizon? Breakage, also at 10 percent, is for the design engineers to use FMEA to determine how to handle today's increasing power densities and lighter weights while improving reliability in future process systems and equipment. Surface degradation at 80 percent is further divided into wear at 65 percent and corrosion at 15 percent. With respect to lubrication, corrosion can be eliminated at this level because paint and protective coatings or stainless steel and other corrosion resistant alloys are used to protect equipment surfaces against environmental damage. By eliminating 35 percent of the global failure modes, a Tribologist or lubrication engineer can focus on wear when using FMEA. If you don't have a lubrication engineer on your FMEA team, get one! Many organizations do not have an engineer with any formal training in lubrication or tribology - the study and application of the principles of friction, lubrication and wear. Adhesive wear is a direct result of metal to metal contact. Surface asperities contacting under load while sliding will generate heat, friction and wear due to insufficient or loss of the lubricating film. The range of adhesive wear can be as low as running-in wear with a poorly specified break-in oil up to catastrophic damage with surfaces welded together due to total loss of lubrication. 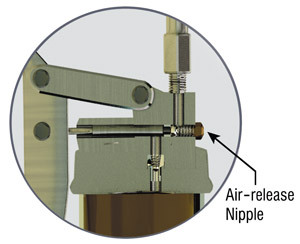 The most important physical property of a lubricating fluid is viscosity. 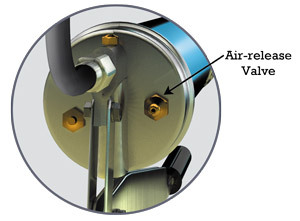 Viscosity measures a fluid's resistance to flow as it relates to load, temperature and speed. Viscosity determines the ability of the lubricant to enter the contact zone of the moving surfaces and remain in the contact zone under the applied load for the necessary time to prevent metal to metal contact. Today's equipment design engineers now see the lubricant as an integral component to improve reliability. That is why it is important to read the original equipment manufacturer's manual and review the recommended oils and greases. However, when an existing process or machine is being applied in a new way, any change to the operating load, temperature, or speed must be analyzed to maintain the proper oil film. While the saying, "cleanliness is next to godliness," does not appear verbatim in the Bible, it certainly needs to be a commandment for proper lubrication practices. Abrasive wear is caused by suspended hard particles in lubricants. These particles are a combination of wear particles generated by adhesive wear, dirt and other abrasive particles from the process or environment and, in some cases, from the degradation of the lubricant itself. 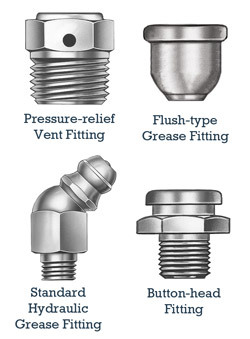 Abrasive wear is why we use filtration and seals. Never assume a new hydraulic system or piece of machinery is clean and never assume a new lubricant is clean. New machinery and systems must be flushed to remove contaminants that entered during manufacturing and assembly. If you want clean new lubricants, then you must specify the International Organization for Standardization's (ISO) cleanliness requirements for new lubricants and even then, use filtration to transfer the new lube from its container into the reservoir or sump. 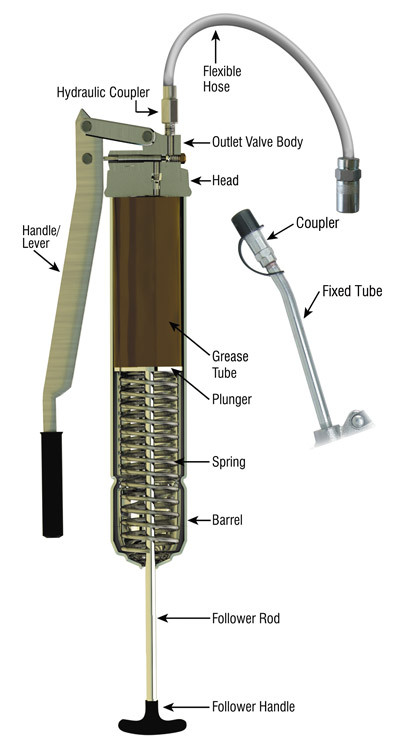 Using dirty lubricants affects the entire system or machine because abrasive particles circulate throughout until they are filtered or settle in the reservoir. Machinery components do not last forever; they have a designed life for their useful purposes. Premature surface fatigue is usually the result of over-speed or overload of the equipment, especially in the case of bearings and gear surfaces. Even in a perfectly lubricated bearing, if you double the speed, bearing life is reduced by 50 percent and if you double the load, the life is reduced by 87.5 percent. We are a nation of tinkers and profit-driven to increase system production by making things faster (speed) or doing more work (load) in the same amount of time. By our own actions, surface fatigue has a dotted line impact on why equipment breaks. Surface fatigue is extremely difficult to detect in operating systems because it is easily masked by catastrophic adhesive wear or catastrophic abrasive wear caused by large chunk spalling. Detection in operating equipment is difficult and typically requires partial disassembly and bore scoping by a trained technician, or direct reading ferrographic analysis of wear particles. In many cases, surface fatigue is only confirmed by complete machine disassembly and inspection of the failed component using magnetic, X-ray, ultrasonic, or scanning electron microscope devices. Over time, oxidation causes lubricants to become acidic. Acidic lubricants are responsible for most surface corrosion. This can be measured by the increase in the total acid number (TAN) of the used oil compared to the new lubricant's referenced TAN. In most cases, if the used oil TAN number is 2.5 higher than the new oil's referenced TAN, then the used oil is sufficiently acidic to cause surface corrosion. Oxidation reactions with the lubricant also cause internal deposits of gums, varnish and sludge. Surface corrosion caused by additive reaction is rare. It is generally found in additive reactions with copper or silver surfaces. This is easily detected using elemental oil analysis. In conclusion, by adding the above risk priority numbers (RPNs) in Figures 2-5, the sum is 65.005% representing the global percentage of equipment failure modes caused by surface degradation. The best way to reduce this global failure mode percentage in your processes and equipment is to improve your lubrication program. The lubrication program should emphasize the selection of lubricants that must be application driven based on the load, environment, temperature and speed of the process. The lubrication program also must ensure the five basic rights of machinery, which are the right lubricant of the right quality delivered in the right place at the right time in the right amount. Formal lubrication training is needed to establish a truly effective lubrication program. Most organizations require a cultural change in the way they view lubrication fundamentals. The Conceptual Design is a preliminary stage where a description of the proposed system in terms of a set of integrated ideas and concepts are made. The result is the generation of many Design Concepts which are supported to evaluate the feasibility of each conceptual alternative. Advanced RAM analysis allows quick screening of various development options to assess suitability (from a functional & commercial perspective) of the proposed designs. 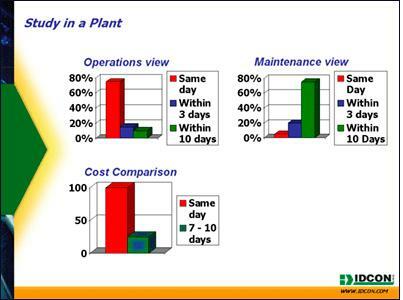 How does equipment/unit reliability impact production? What happens if equipment performance is worse than expected? What size storage tanks (equipment) should I have? What is the impact of unit over-design (catch-up) margins? What is the optimum unit configuration in order to maximise production/availability and maintenance reduction? Will it be possible to meet the customers’ demands for products? What is supply efficiency to each customer? Advanced RAM analysis helps you to decide what is the best configuration for your assets and aids you in answering these and many more questions. What happens if I improve equipment reliability? What is the financial impact of investing in more reliable equipment? Should I spare equipment to increase reliability? How many spares do I need to have and how would it increase system reliability? Advanced RAM analysis ensure that the system design meets your required performance targets. By identifying the critical elements and the bottlenecks in the system, the results from an Advanced RAM study can be used to feed in to other methodologies, such as Risk Based Inspection (RBI) and Reliability Centred Maintenance (RCM). Subsequently, the output from the RBI and RCM processcan then be fed back into the model to provide a final picture of system performance. During the Operational phase, it is not very cost-effective to make decisions in regards to the design. However, Advanced RAM analysis can also be used to assess impact of planned modifications. The most common evaluation carried out during the Operational stage is related to the maintenance philosophy which, basically, refers to number of spares, re-stock time and available personnel. There is always a trade-off between the cost of lost production versus the cost of maintenance. For mature systems, as we keep asking more of our ageing assets, the Advanced RAM methodology allows you to find potential areas for rejuvenation or facilities life extension. Many sensitivity cases can be applied to a mature system model, which will indicate to various rejuvenation options and the potential gains quantified. Ageing systems and old technology – what is critical when it comes to production loss? Decommission of problematic systems – which system should be turned off? Where should I focus main preventive maintenance? Sometimes, due the high number of variables in an oil and gas development, it is not easy to identify at where the operational expenditure exceeds the revenue, making the system no longer economically viable. By modelling all the transient behaviours of a system, Advanced RAM analysis helps you to evaluate decommissioning strategies viability. Predictive maintenance is a term coined years ago as the means to use technology to identify a component defect in its earliest stage of degradation. Today some also call this same process condition-based maintenance (CBM). Either way it is detecting defects early. The premise behind this activity is when a defect is detected early; the repair can be performed during a scheduled outage. The lead time prevents secondary costs that would be incurred by an unscheduled outage due to the lack of defect knowledge. We break defects down into two categories; the first is the primary state of failure and the other is secondary state of failure. A primary failure is the first detectable signal that a defect exists. For example, if you are dealing with equipment the first detectable signal a component is failing could be a vibration signature that exposes a bearing fault frequency. If the same bearing as above fails catastrophically all the additional damage incurred is considered secondary failure. When the bearing that was identified in the primary state fails catastrophically the shaft will drop from lack of support causing shaft and housing damage. The shaft and housing damage did not have to occur, but did. Therefore it is considered secondary failure. Secondary failure is most often a result of not taking action on items exposed from the predictive maintenance technologies exception reports. When the primary bearing defect is exposed, the fate of the component can only be imminent failure. Whether secondary damage occurs, is up to the management since they control when the repairs take place. Unfortunately, the first usual response to a high priority defect is “will it make it to the next shutdown?” Then the premise of condition based maintenance has been at best diluted or at worst ignored. No one cares more about making a correct defect call than the Reliability technician. Whether it is a defect discovered using vibration, ultrasonic, infrared, or any other of the numerous predictive maintenance technologies available, the Reliability technician wants to confirm it was a valid diagnosis. What normally happens is the Reliability technician will wait for the components of the diagnosed defect’s to be removed and retrieve it for examination. When confirmed as a valid call, the component is normally saved as a trophy of sorts. This is understandable as the technician is proud of the fact the call produced a defect that could be corrected before secondary damage could occur. It should only make sense they would have the most interest in finding the solution. With some additional basic knowledge they could determine how the defect materialized. With basic fracture pattern knowledge, technician’s would be able to identify the failure mechanism by reading a fractured component’s surface. To determine if a part failed due to fatigue or overload is a great step toward knowledge and/or solution because the two failure mechanisms only can occur under conditions specific to each mechanism. As an example, let’s say a shaft failed and the technician can determine it is due to fatigue. Let’s further say he or she can also determine the fatigue was due to misalignment. 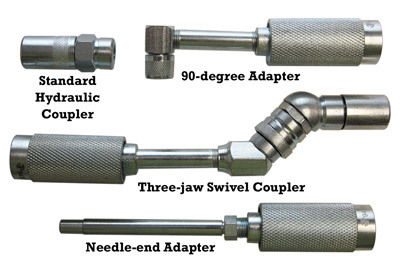 The technician can show proof both by reading the vibration signature and by reading the failed shaft’s surface. What is there to gain from this? Predictive Maintenance Technicians that truly understand failure mechanisms and how they occur. Solutions and corrections in the field that last longer because they are based on verified knowledge. Higher level of documentation accuracy on work order closeout. Technicians that participate from a higher level of knowledge on root cause analysis teams. Higher morale because of value-added input. Taking predictive maintenance to the next level is a natural progression of a company’s overall Reliability approach. Mark Latino is President of Reliability Center, Inc. (RCI). Mark came to RCI after 19 years in corporate America. During those years a wealth of reliability, maintenance, and manufacturing experience was acquired. He worked for Weyerhaeuser Corporation in a production role during the early stages of his career. He was an active part of Allied Chemical Corporations (Now Honeywell) Reliability Strive for Excellence initiative that was started in the 70’s to define, understand, document, and live the Reliability Culture until he left in 1986. Mark spent 10 years with Philip Morris primarily in a production capacity that later ended in a reliability engineering role. Mark is a graduate of Old Dominion University and holds a BS Degree in Business Management that focused on Production & Operations. This article was previously published in the Reliable Plant 2014 Conference Proceedings. By Mark Latino, Reliability Center Inc.
As you begin a new year in your organization, you must commit resources to answer the latest challenges and bring success to the bottom line. One of the main concerns in many companies is employee well-being and health. Indeed, to meet all of the challenges you face this year, you will need to ensure that your workforce is engaged and healthy. For many people, the resolution of daily exercise is made each year only to dwindle and flame out over the coming days, weeks or, in a few fortunate cases, months. Some folks actually do make it a lifelong way of life, and I applaud those who do. However, the vast majority of people typically fall back into their old routines without making any real changes to improve their health and well-being. 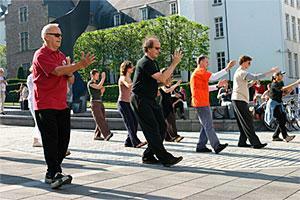 Within an organizational setting, ergonomics and stretching can be key elements in achieving success in this area. I would be interested in knowing how many people have formal before-work and during-work stretching regimens in place to engage their workforce and potentially provide a method to improve the health and well-being of their employees. Of course, you can place programs, documents, checks and measurement systems in the environment, but without an engaged and healthy workforce, you are still lacking the essential element for any change program’s success. I would also be interested in the cultural changes that have taken place as organizations instituted these types of programs as part of the standard work process of each day. In previous environments, I have seen where the day begins with music playing across the organization and people rising to their feet in their workgroups, moving to a series of well-designed stretches. Once completed, the group comes together for the five-minute pre-production review and then goes to the line to start the day. Have you been involved in a program like this? If you have made the transition to this sort of cultural change, how was it accepted? Do you still have it in place? I firmly believe that people come to work each day looking for something to awaken their senses and bring joy to their time. This may be just the thing to improve recordable case-rate injuries from sprains and strains suffered at work. It definitely is a plan to consider for the new year. If you are like me, you've listened to the Rolling Stones over the years. Their contemporaries, the Beatles, became more artistic and lyrical as they evolved, but for driving party music, the Stones are still hard for any band to beat. I even heard the words to one of their songs quoted recently: "You can't always get what you want." This much I already knew, but what follows has a lot of meaning in continuous improvement: "But if you try sometime, you might find you get what you need." So many times in problem-solving work, you do all of the analysis with the really smart, expert people and come to what you truly believe is the right answer — one that you really want to work. But then you find when you implement it, "You know, it just didn't work," or "It just didn't last," or "Nobody would buy into it." Most people tend to get hung up on what they want rather than what they need. They want their elegant solution to work. They fall in love with it. For engineers, this is usually the technical solution. Having found that perfect solution, well, let's not waste any time getting it in place. Forget all of that soft-skills stuff; just make people do it now. For some, change management is simply convincing people to do things that, for various reasons, they don't seem to want to do. Others have talked of the frustrations and time consumed in hunting down and eliminating the wily, elusive, supposed single root cause, as opposed to just implementing some of the many solutions to various, fairly obvious contributing causes that just make things quickly better. This isn't saying that structured analysis isn't necessary, but rather that it's not the biggest part of fixing or improving. Unfortunately, because they tend to address fundamental issues, too many of the "best" solutions become larger, which usually means expensive and time consuming. That's also frustrating, as managers will usually push back at the thought of expensive. I remember a problem that was aggravating and constantly frustrating plant personnel (as well as affecting productivity and quality) that could have been fixed for about $2,000. The solution had been developed with some help, but there was another, much more extensive engineering project in the works with a price tag of $80,000 that also would have taken care of that problem, among other things, so why spend the $2,000? Besides, adding in the fix on the small issue would help justify the big project. Unfortunately, after a number of months of management pushing back, the $80,000 project was abandoned. Sadly, the $2,000 project seemed to have been forgotten by then. Months of productivity and an opportunity to build some ownership were lost. It was their solution; they would have made it work. Instead, there was ongoing frustration at the needless waste and at being ignored. Of course, management again paid the price of being tagged with "too cheap to do the right thing." The real trick in all of this is finding the way to "what we need." So, what is missing? What do you have to "try sometime?" Well, how about listening to people? How about giving them the opportunities to make changes? How about helping them rather than telling them? Amazingly, people really know a lot about what the issues are and how to deal with them if asked and given the opportunity rather than being pushed aside while the experts deal with it. Implement a process that uses communication to build ownership. This doesn't just happen, and you can't just do it now and again when you have some time. It takes a routine, everyday, structured process that will go on forever. Issues and improvements are identified and discussed. Actions (including communication) are decided on, along with any necessary follow-up. The daily, small-unit shift exchange meetings can be the most powerful way to get this to happen. It also takes the involvement of supervision, maintenance personnel and even engineers to get to what you need. Although people know what they need, they usually require some help getting there and are typically receptive to genuine attempts to assist them. Engineers and managers are there to help people find their way to the right answers and, in doing that, develop to their potential. Remember, the right approach is not to get people to do things that they probably don't want to do, but just to help them get to what they need. Now more than ever it is important to understand what keeps people working and doing their best for the organization. While the current economic situation has created tough times for businesses, it has also created one of the highest unemployment rates in decades. However, there is a misnomer related to today's high unemployment rates, and that is that people will not leave their organization because it is too difficult to find a job. The fact is that talented people can find a job anywhere. One of the ways to lose talented workers is through passive recruiting. This is a process where companies who are hiring (and there are still plenty of them) are vigorously recruiting talent who are not looking for another job. For all intents and purposes, these employees are happy with their current company and satisfied to have a good job. The recruiting company approaches these people offering more money, better working conditions, more benefits, higher status, etc. One of the most important tasks ahead of you is to keep the existing workforce engaged and productive. To accomplish this when people are anxious about the future of the organization or the prospect of being the next to go, it is a matter of showing your employees that you value them and their loyalty and that they are not just a commodity. You not only want to keep them, but you also want to motivate and inspire them to perform exceptionally for the organization. Pat Galagan, editor-at-large for the American Society for Training and Development (ASTD), had this to say in the March issue of Economy Watch: "People are critical to the success of every organization. The leaders and organizations that adopt the smartest strategies for attracting and retaining their key talent will survive this economic crisis and be in a prime position to come out of it poised to move ahead of their competition." 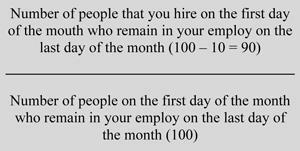 In this example, even though your retention rate is 90 percent, your turnover rate is 50 percent. However, measuring the retention and the turnover rate still does not tell the whole story. Consider examining the voluntary vs. the involuntary turnover. In order to reduce turnover, you must have a strong understanding of how many people are leaving voluntarily. Only then can you take action to reduce the turnover rate. In the above example, of the 50 employees who left the company, 39 left as a result of permanent layoffs and one was fired for violation of company policy. The remaining 10 were recruited away by the competition. Below is the formula for calculating voluntary turnover. Honor responsibilities to workers: Determine what you believe are your responsibilities to your workers. The best way to do this is to ask them. Is it more, cleaner or nicer break rooms/restrooms? It could be any number of things. The best organizations take the time to find out. Is it better communication? Often it's the little things. Determine how to recognize: Ask employees, "Do you want to be recognized in public or would you prefer private recognition?" Also, be sure to personalize the presentation. What does your company do to try to retain right-fit talent? What does your company do to reduce voluntary turnover? Or, what doesn't your company do? 1) If you are going to cut maintenance cost, you cannot focus on cost itself but rather on what drives cost. Perhaps use an analogy in safety. You can't just send out a memo or shout "improve safety." You need to fundamentally change the way people behave. Another analogy is energy cost. How would you reduce energy cost? You have to focus on things that save energy and drive that cost such as leaks, insulation, etc. When it comes to maintenance cost, often it is just slashed without considering the effects of that cost cutting. Again, focus on what drives maintenance cost, not the cost itself. 2) Get a common understanding between operations and maintenance on what constitutes good maintenance. I recently worked in a plant that has tried for years to improve reliability. However, when asked what constitutes good maintenance, operations answered that "75 percent of the work is executed the same day," while maintenance answered that "good maintenance is when 4 percent of the work is executed the same day." Plant personnel must sit down and define "what good looks like." Otherwise, you will never be able to drive improvement in the right direction. 3) Only request maintenance jobs to be done today or tomorrow if it is absolutely necessary. This is a principle that makes sense and that most people understand, but few actually do. It is the classic know-do gap. It is also often triggered by not trusting the maintenance department. If it is not submitted as an emergency, it will not be done. In the past, people have started to scream louder and louder to get jobs done. Eventually, everybody is screaming. Managers must take charge and enforce a meaningful priority system. 4) Inspect equipment with detailed look, listen, smell, feel inspections together with a minimum of an infrared gun, flashlight and a stroboscope. There is no way you can plan for next week if you don’t know what is about to break down. Many plants are in a catch-22. "There is no time to do inspections because we have too many breakdowns" is something I hear several times a month. Management has to take charge and break out of this cycle. It will initially cost some additional time that will be saved in both maintenance cost and uptime later. There's no magic formula. It's very simple. Collect the tools, find a craftsperson who is highly skilled and willing to do the inspections, and get going. Detailed documentation is necessary at some point, but it is more important to begin the process. The above is a good list to start on for the average plant. Most plants do some of this already; however, they just need to improve. There is no capital cost — just the cost for doing repairs that must be done anyway earlier and cheaper. Most oil samples are taken based on a fixed schedule. For large, stationary rotating equipment, monthly or bi-monthly samples are common. Proactive maintenance programs depend on regular checks for oil cleanliness, dryness and lubricant quality. However, machines can and do fail for a variety of reasons, and there is a certain randomness to the onset of these failures. Furthermore, the failure development period is equally unpredictable, with some failures taking months to develop, while others are sudden and abrupt. In the March-April 2013 issue of Machinery Lubrication, I addressed machine criticality analysis as an essential tool to define the Optimum Reference State (ORS) for numerous lubrication and oil analysis activities. The Overall Criticality Matrix (OCM) is constructed from two assessments: the Machine Criticality Factor (MCF) and the Failure Occurrence Factor (FOF). The MCF relates to the consequences of machine failure while the FOF relates to the probability of machine failure. Both the MCF and the FOF are highly influenced by the effectiveness of “early fault detection.” In other words, the effectiveness of early fault detection sharply reduces machine criticality (for details on this, read the article atwww.machinerylubrication.com/Read/29346/machinery-criticality-analysis). This is the critical link to the “unscheduled” oil analysis strategy. Its theme is not just predictive maintenance (PdM), but more specifically, early predictive maintenance (EPM). Let’s start by reviewing the widely used P-F interval. A modified version is shown in Figure 1. The “P” is the point when an abnormal wear condition or fault is first detected. The “F” is the functional or operational end of the failure cycle requiring repair or replacement. Failures with short development periods usually go undetected when tests (e.g., vibration and oil analysis) are performed infrequently (even monthly analysis is viewed as infrequent). Conversely, frequent detection methods not only can report a developing failure but also have the potential to detect that failure early (in the incipient stage). There are specific tactics and tools for doing this well. Again, the secret to this strategy is the frequency. It enables a much higher percentage of failure detection (saves) events, especially earlier detection. The purposeful benefit is mitigated machine damage and reduced or no unscheduled downtime (longer P-F interval). While PdM concentrates on predicting the end of a machine’s (or lubricant’s) service life, EPM puts critical focus on timing - not just detecting - by detecting early. It seeks a budding problem, not a burgeoning problem. In Noria’s seminars, we use the expression, “You can’t catch a fish unless your hook is in the water.” Likewise, in oil analysis, you can’t catch a fault unless your hook is in the water. There’s an earlier tier to oil analysis called the “detection phase,” which in my view is a huge untapped opportunity in condition-based maintenance. 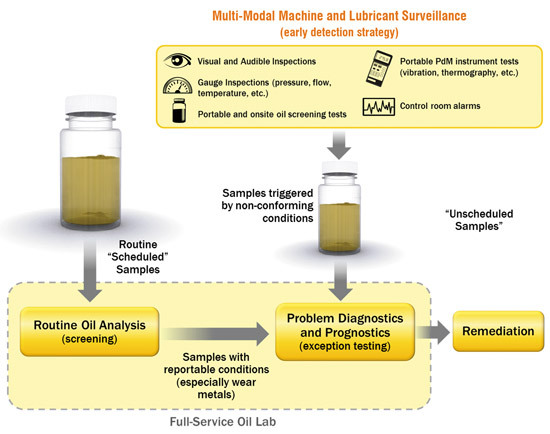 Most scheduled oil analysis programs skip over the detection phase by attempting to catch impending machine failures and only take infrequent snapshots of oil condition. The detection phase of EPM is continuous failure surveillance across numerous parameters. It integrates skillful and frequent human inspection tactics with other conventional monitoring technologies. A few years ago, I wrote a column on the power of the one-minute daily inspection. This is a critical and often underutilized modality of surveillance and detection. Many impending and precipitous failure conditions that were first reported by scheduled oil analysis could have been detected much earlier if better and more frequent inspection methods were in place, such as those in the list above. The economics of early detection are enormously improved as well. As noted previously, failure detection and failure analysis are different concepts. Once an abnormal condition has been detected, it can be investigated further to determine where it is coming from, the probable cause of the failure, how severe and threatening it is, and the corrective action. This is where oil analysis and other predictive technologies can be very valuable. “Unscheduled” oil samples can then be forwarded to the lab for troubleshooting purposes (diagnostics and prognostics). These include samples from secondary sampling ports to help localize the source of the problem. In the laboratory, specialized qualitative and quantitative tests can be performed to characterize the nature of the condition. These might include wear particle identification (XRF, SEM-EDX, analytical ferrography and many others). The skills of a triboanalyst and a multi-technology PdM specialist can combine lab data with surveillance data for the most complete picture of the machine’s condition (see Figure 2). 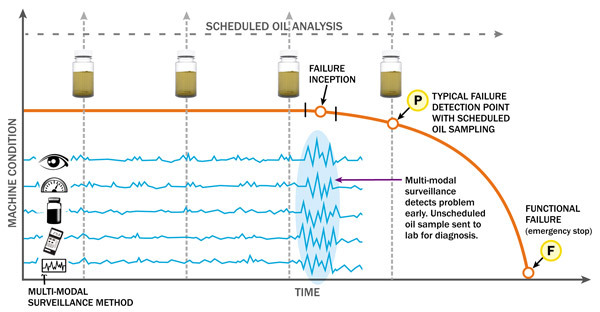 Unscheduled oil analysis is not an alternative to scheduled oil sampling and analysis. Routine oil analysis is still needed for many reasons. The most important is proactive maintenance, which uses oil analysis to monitor and control the presence of failure root causes. These include verification of the lubricant’s physical and chemical properties as well as contamination control. The benefits of a fine-tuned proactive maintenance program are much slower machine wear rates (longer machine service life), fewer overall machine failures and less associated downtime. When proactive maintenance is combined with EPM, a comprehensive and more efficient condition-based maintenance program results. Early predictive maintenance is about extreme vigilance. It involves the development of more effective inspection skills and a more effective means of inspection (machine modifications). It also requires a culture change and management support for remediation of machines that have not yet failed.